When you have something to eat or drink, it passes down the oesophagus (gullet) into the stomach. The flow of food/liquids should definitely be one-way. 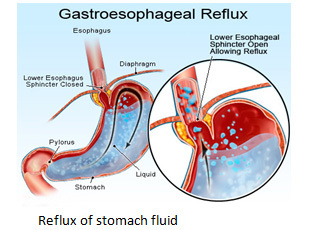 However, reflux occurs when stomach contents travels in the wrong direction back up into the oesophagus. Unlike vomiting, which is forceful, reflux mostly occurs without us being aware that it is happening. Gastro-oesophageal reflux disease (GORD) is a common condition where acid from the stomach leaks out of the stomach and up into the oesophagus (gullet). 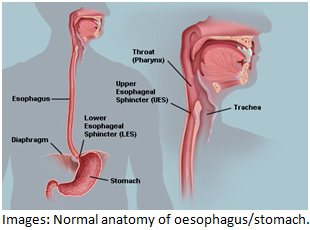 The oesophagus is a long tube of muscle that runs from the mouth to the stomach. GORD occurs only occasionally for some people, but if the symptoms persist it’s usually regarded as a condition that needs treatment. Oesophagitis means inflammation of the lining of the oesophagus. Most cases of oesophagitis IS due to reflux of stomach acid which irritates the inside lining of the oesophagus. The lining of the oesophagus can cope with a certain amount of acid. However, some people are more sensitive than others, and develop symptoms with only a small amount of reflux whilsts others have a lot of reflux without developing oesophagitis. There is a ring of muscle around the lower end of the oesophagus which is there to stop reflux. When we eat or drink, the muscle relaxes but it then tightens up when food or liquid has entered the stomach. If the muscular ring gets too slack or remains open for an extended period of time, reflux can occur. Heartburn – a burning pain or discomfort felt behind your breastbone that may move up into your throat. Wheezing, dry cough, hoarseness or chronic sore throat. The most frequent symptom is heartburn which is a burning sensation in the chest. Heartburn is often most noticed at the lowest end of the bone and the discomfort rises upwards to an extent that varies from individual to individual. Sometimes the burning feeling can reach all the way up to the throat. Heartburn often seems worse after rich meals, citrus fruits, hot beverages or alcohol. Occasionally it can be felt deeply within the chest – almost within the back. Some patients notice reflux when some of the contents of their stomach ‘repeat’ by coming back up the oesophagus as far as the throat or even the mouth. A few patients notice discomfort or pain as they swallow. It is quite common for these symptoms to be worse at night or at other times when patients lie down. Wheezing, dry cough, hoarseness or chronic sore throat can make the diagnosis difficult as these symptoms can mimic other conditions. The symptoms occur due to the refluxed acid irritating the windpipe (trachea). Asthma symptoms of cough and wheeze can sometimes be due to acid leaking up (reflux). Other mouth and throat symptoms sometimes occur such as gum problems, bad breath, sore throat, hoarseness, and a feeling of a lump in the throat. Severe chest pain develops in some cases (and may be mistaken for a heart attack). One common cause of acid reflux disease is a stomach abnormality called a hiatus hernia. Hiatus hernia occurs when the upper part of the stomach and lower oesophageal sphincter (LOS) move above the diaphragm, a muscle that separates your stomach from your chest. Normally the diaphragm helps keep acid in our stomach. But if you have a hiatus hernia, acid can move up into your oesophagus and cause symptoms of acid reflux disease. Taking aspirin, ibuprofen, certain muscle relaxants or certain blood pressure medications. The circular band of muscle (sphincter) at the bottom of the gullet (oesophagus) normally prevents acid leaking up (reflux). Problems occur if the sphincter does not work very well. This is common but in most cases it is not known why it does not work so well. In some cases the pressure in the stomach rises higher than the sphincter can withstand – for example, during pregnancy, after a large meal, or when bending forward. If you have a hiatus hernia (a condition where part of the stomach protrudes into the chest through the diaphragm), you have an increased chance of developing reflux. Most people have heartburn at some time, perhaps after a large meal. However, about 1 adult in 3 has some heartburn every few days, and nearly 1 adult in 10 has heartburn at least once a day. In many cases it is mild and soon passes. However, it is quite common for symptoms to be frequent or severe enough to affect quality of life. Regular heartburn is more common in smokers, pregnant women, heavy drinkers, those who are overweight, and those aged between 35 and 64 years. Because the severity of the condition varies from being just an occasional nuisance for some people while others are quite seriously troubled, so the intensity of treatment varies from one individual to another. There may well be changes in your lifestyle that you can make to help. There are also medicines – either bought over the counter or prescribed by your doctor – that can help your symptoms. There is no simple ‘cure’. It’s thought that GORD is caused by a combination of factors, but the most common is the failure of the lower oesophageal sphincter (LOS) – a ring of muscle towards the bottom of the oesophagus. This acts like a valve, opening to let food fall into the stomach, then closing to prevent acid leaking out of the stomach. In GORD, this sphincter doesn’t close properly, allowing acid to leak up out of the stomach. Your symptoms are persisting despite acid medications. Further testing aims to confirm or disprove the diagnosis of GORD, while checking for any other possible causes of your symptoms, such as functional dyspepsia (irritation of the stomach or gullet) or irritable bowel syndrome (IBS). 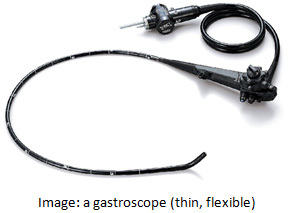 An endoscopy is a procedure where the inside of your body is examined using an endoscope, which is a long, thin, flexible tube with a light and camera at one end. To confirm a diagnosis of GORD, the procedure required is called Gastroscopy, where an endoscope will be gently inserted into your mouth and down your throat. In Australia, all patients undergoing gastroscopy receive sedation, and patients do not remember the procedure and have pain or discomfort during the procedure. The camera and quality of the images are far superior to previous imaging techniques such as Barium swallow or X-Ray. Endoscopy shows if the surface of your oesophagus has been damaged by stomach acid. It can also rule out more serious conditions that can also cause heartburn, such as stomach cancer. You can request an appointment, or for further information, please call one of our receptionist team on Rosebud Endoscopy . Most people are ready to go home after resting for an hour or so, enough time for the anaesthetic to wear off. You must not drive home or operate machinery for 24 hours after having the sedative. You will need somebody to accompany you home and to stay with you until the effects have fully worn off. Most people are able to resume normal activities the next morning.When your family or friend arrives to pick you up, your gastroenterologist will go through the findings and give you a report. A copy of the endoscopy report will also be sent to your family doctor. Depending on the results, your gastroenterologist will simply reassure you that there is no concerning findings; or if you need to see your Family Doctor; or to return to see your specialist if needed (you will need to make an appointment before you leave the endoscopy centre). You may feel bloated if some air remains in your stomach. It is advisable to sit upright and if possible walk around to help relieve this. Warm drinks and peppermints will also help you to pass the wind. You may have a sore throat, which can last up to 48 hours. Taking throat lozenges will help. You should contact our office if you have persistent pain or vomiting. Scarring and narrowing (stricture) – this is uncommon. Barrett’s Oesophagus. In this condition the cells that line the lower oesophagus become changed. The changed cells are more prone than usual to becoming cancerous (Read our special section on Barrett’s Oesophagus). Cancer. Your risk of developing cancer of the oesophagus is slightly increased compared to the normal risk if you have long-term acid reflux. If you’re overweight, losing weight may reduce your symptoms, as it will reduce pressure on your stomach. Ask your gastroenterologist for useful tips to help you lose weight, and keep the weight off. Giving up smoking can help, as smoke irritates your digestive system and can make your symptoms worse. Alcohol, coffee, chocolate, tomatoes, or fatty or spicy food can trigger the symptoms of GORD. If you suspect that any of these make your symptoms worse, remove them from your diet to see whether your symptoms improve. Although you can trial with over-the-counter medications (such as antacids), if your symptoms fail to improve, it is highly recommended that you discuss it with your Family Doctor. Depending on how your symptoms respond, you may need medication either on a short or long-term basis. While antacids can be useful, they shouldn’t be taken at the same time as other medicines, because they can stop other medicines being properly absorbed into your body. They may also damage the special coating on some types of tablets. Ask your GP or pharmacist for advice. To minimise any side effects, your GP will prescribe the lowest possible dose of PPIs that they think will be effective in controlling your symptoms. The symptoms of GORD can sometimes return after a course of PPIs has been completed. Go back to your GP if you have recurring or persistent symptoms. In some cases, PPIs may be needed on a long-term basis, particularly when a hiatus hernia has been found during gastroscopy. If PPIs can’t control your GORD symptoms, another medicine known as a H2-Receptor Antagnoists (H2RA) may be recommended to take in combination with PPIs on a short-term basis (two weeks), or as an alternative to them. H2RAs block the effects of the chemical histamine, which is used by your body to produce stomach acid. H2RAs therefore help reduce the amount of acid in your stomach. Surgery should only be considered as a last resort, and only after careful consideration and consultations with your gastroenterologist or surgeon. The specialists will be able to discuss the benefits and potential side effects in detail with you. In Australia, Laparoscopic Nissen Fundoplication (LNF) is a surgical procedure commonly performed if all medicines fails to control severe reflux symptoms. It uses “keyhole surgery” (hence the term “laparoscopic”), avoiding the need for a large incision. It involves the surgeon wrapping the upper section of your stomach around your oesophagus to form a collar. This helps tighten your lower oesophageal sphincter (LOS), to stop acid moving back out of your stomach. How long the procedure takes, the expected hospital stay, the possible complications and long term results should be discussed at length with your surgeon. Your family doctor or gastroenterologist can recommend and help you choose a well-respected upper gastro-intestinal surgeon, who has low surgical complications. For further advice and information, you can request an appointment, or for further information, please call one of our receptionist team on Rosebud Endoscopy .